Upending the Foreign Policy Consensus, Is Trump an Anomaly, or the New Normal? 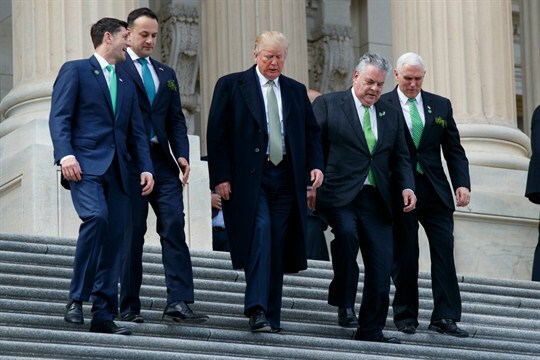 President Donald Trump and other U.S. leaders walk down the steps of the Capitol building after a luncheon with Irish Prime Minister Leo Varadkar, second from right, Washington, March 15, 2018 (AP photo by Evan Vucci). For more than 70 years after World War II, U.S. foreign and national security policy followed a distinctive pattern. Despite many policy differences between Republicans and Democrats, there was also deep agreement about the overall goal and logic of U.S. strategy. Across the political spectrum, most political leaders and opinion-shapers believed that preserving the global order by cultivating and working with allies and partners was the best way to advance U.S. national interests. And they agreed that this should be done by a cadre of foreign and national security policy experts who moved in and out of government service, guided by elected leaders who had themselves developed expertise in the complexities of world affairs and statecraft. Influence was something to be earned over time through effort and paying one’s dues. As much as possible, bipartisanship was to form the foundation of statecraft.